This beautiful Chocolate Labrador is called Molly. Molly’s painting was a Christmas gift in 2018. The client contacted me to show me the photos she had of Molly. Molly is very sadly no longer with us and there wasn’t any photos of the “typical portrait” pose. However when I saw this photo of Molly laying with her head on her paws watching her mum I just new this would make a wonderful painting. It isn’t always necessary to have a “posed” photo to work from. I just love paintings that tell a story. My own little dog used to do just the same thing. He used to lay watching me whilst I worked. Molly reminded me of him a great deal. You will see below work in progress photos of my portrait of Molly and then the final image along with a photo of the painting framed. The client chose a lovely silver frame which suits Molly’s colouring and background beautifully. I have lots of frames to choose from. Ranging from narrow to chunky, traditional to modern frames. See below my clients comments upon receipt of her portrait. Portrait arrived ok. Cried again when I saw it! I honestly can’t thank you enough. I love it so much, it’s just as beautiful as she was. I hope you have a wonderful Christmas. Would you like a pet portrait? If you would like to discuss about having a pet portrait, feel free to contact me, I’d love to hear from you. Lorraine Gray has been a pet portrait artists for over 20 years. She has appeared on BBC Television and is an author of books about painting pet portraits. 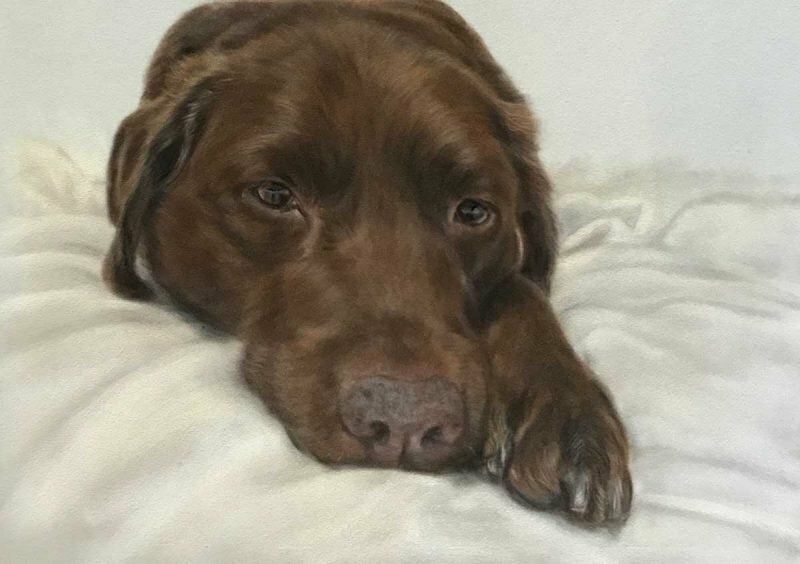 Working mainly in pastels and oils her pet portraits have been sold worldwide. Lorraine lives near Royal Ascot & Windsor with her German Shepherd.